Jenny Fran Davis ’17 only graduated this past May, but St. Martin’s Press is set to publish her debut novel on Oct. 3. Last week, The Argus published our crosstalk about “Everything Must Go” (spoiler alert: we loved the book), and we spoke to Davis herself. Read our conversation with our recent alum—and former Argus Editor-in-Chief—about her experience of writing, editing, and publishing the novel. The Argus: What was your original inspiration behind the book? JD: I spent a semester of high school at a Quaker farm school in Northern California where we took Peace Studies instead of English, Global Issues instead of history, and environmental studies instead of biology or chemistry. It was probably the most challenging, terrifying, hilarious, and formative four months of my life. And then a year or so later, I was working at a Jewish farm camp the summer before starting Wesleyan and started reading through all the journal entries and notes I wrote during that semester. After the kids went to bed I stayed up and started to outline what would become the first draft of Everything Must Go. I consider the novel in its finished form to be a sort of failed autobiography—it began as something that was mostly rooted in personal experience, but evolved into something mostly unrecognizable from both its original self and my life. A: Was there anything big that changed in the novel over the course of writing? JD: I wrote so many drafts, and each time a lot of the plot changed, but the most major shift was formal—switching to the epistolary format from the traditional third-person. This was the end of freshman year, after writing a really rough draft over winter break and then doing some editing in the spring. Something didn’t feel urgent or exciting or fresh, and when I was on the Metro North home from school at the end of the year, it occurred to me that the whole thing should be told in letters home from Quare to Flora’s friends in New York. It, of course, became a lot more complicated than that—there are so many other types of documents, as well as many written by characters other than Flora—but the letters idea is what I think let me finish the book. A: We looked back at the interview you did with Molly [Schiff ’18] right after getting the deal with St. Martin’s [Press] and it mentioned that you started writing novels when you were 10. What made you want to write? Do you remember the first thing that you wrote that you felt really satisfied with, like it was something good that you wanted other people to read? JD: There’s this part of Claudia Rankine’s interview with the MacArthur Foundation—they interview the “genius grant” winners about their work—where she says something like, “In a college class I studied Adrienne Rich, and I thought, ‘This says ALMOST what I would like to say.’ And after that class, I just started writing.” I think the impetus to write is sort of similar for me: I read books that said ALMOST what I would like to say, with characters that were ALMOST like those I would have created and ideas that were ALMOST the ideas I would’ve chosen to explore. None of this was intentional at the time, but looking back, that’s where it started: that small gap between the books I adored and the books I wanted. I don’t really know what, substantively, lived in that gap. I think it was just the space between recognition and real reflection. I think the first thing I wrote that I was satisfied with was this collaborative class project that I engineered and forced everyone in my third-grade class to participate in: making our own version of Chicken Soup for the Soul for our teacher, who always read us essays from those books. I think it was called “Chicken Soup for the Third-Grade Soul” or something. I don’t really remember my essay, but I remember that something clicked when I wrote it. But yeah, since age 10, once I started writing novels—the first of which were just fifty-page stories that were literally ALMOST Judy Blume books—I haven’t been super excited by the idea of other people reading my work. Nothing really compares in terms of anxiety and self-loathing. With this book, I’m proud of some parts, and other parts still make me cringe. Every time I think about the fact that in a few days, millions of people will be able to read it without the disclaimers I make my friends and family endure, I feel sort of sick. Giving up control over one’s audience is intensely scary! A: We get a sense, almost a summary, of Flora falling in love with Elijah, but we’re not walked through it in the same way that we’re walked through everything else at Quare. Why did you choose to start the “meat” of the text after she’s already enamored by him? JD: The Elijah obsession is the closest we really come in this book to the familiar, heterosexual love story that a lot of readers look for and that some writers use to shape a story, to give it structure and meaning. I thought it might be cool to shove that entire part into the beginning, just to see what would happen. Like, what happens when the “love story” dissolves by the middle of the book? The real story has more room to unfold, and Flora’s relationships with more interesting characters, like Juna and Dean and Lael, become crisper and more resonant. But I’m still always surprised by how much people focus on Flora’s initial love for Elijah when they talk about the book. A: Great! I think I personally focused on it (after reading a Goodreads comment about this very idea) because it articulated what I see as a specific, unique quality of your YA novel, which initially does follow the format of “girl falls in love with boy that she can’t have/may be too cool for her”—and when we get to know Flora as an individual, it’s so exciting because we get to see what sets her apart rather than the duller slow-fall-in-love tale. A: You have a two-book deal with St. Martin’s Press, so what’s in the works for your second book? JD: Oh, god. I’m pretty behind on Book 2, which is what it’s been known as in my mind for the past year or so—it’s going to be so weird when it has a name! I also like to think of it as Book 2—and, even more so, to think of EMG [“Everything Must Go”] as Book 1—because I’ve had a lot of anxiety about having written EMG as an eighteen-year-old, and it helps to keep it all in perspective: everything goes into the archive, and nothing is all-encapsulating in terms of my identity as a writer. So Book 2 is so far fairly different from Book 1: it’s not epistolary, at least not now, and it spans more time, and I think my voice as a writer has changed or at least has had to change for this specific project. It’s been so challenging. But I will say that one of the central protagonists of Book 2 is a character from Book 1, even though the books are really different. And maybe because of that continuity of character, I am thinking of the books as talking to each other in some way or growing out of each other. 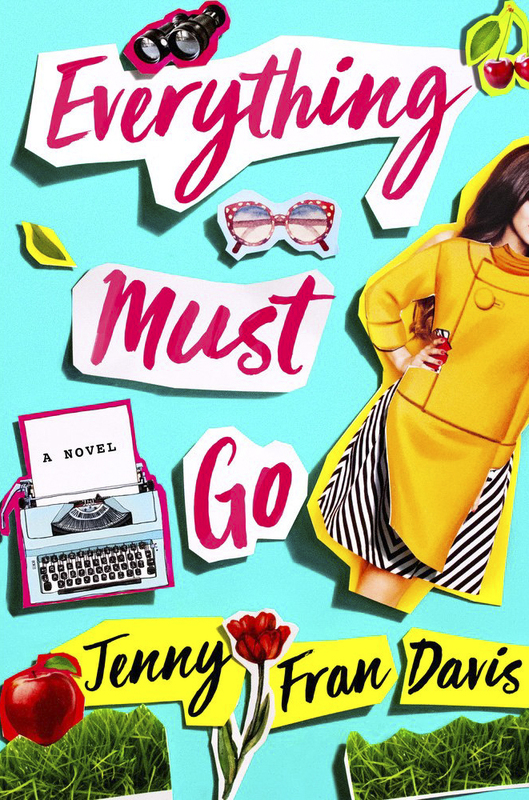 “Everything Must Go” by Jenny Fran Davis is released today, Oct. 3. Davis is coming to R.J. Julia on Friday, Oct. 13 at 7 p.m. for a book reading.